Immediately after attending mass at Westminster Cathedral, the moment I stepped out of the church, I suddenly wanted to eat tiramisu. I asked my friend, who also attended mass, if she can come with me to a small Italian café at Covent Garden, probably a mile away from the cathedral. She suggested that maybe I can just buy one from the grocery or from any bakeshops around. I refused, and said, ‘No, I wanted to get it from that Italian café, it’s the most authentic tiramisu that I know of.’ Out of her kind heart, she obliged. We took the bus and found our way to the Italian café. Unfortunately, there’s no tiramisu. There were other authentic Italian desserts and the guy enthusiastically offered and explained each of the desserts, but I simply replied, almost with a tone of a child nearing to throw a tantrum, ‘No, I want tiramisu!’. We left the café and asked my friend if it’s OK if we can look around, find some Italian restaurants and check if they have tiramisu. She exclaimed, ‘You’re like having a gestational craving (loosely translated for paglilihi).’ I can feel that her patience is getting thinner so I agreed to just leave it and just forget about tiramisu. 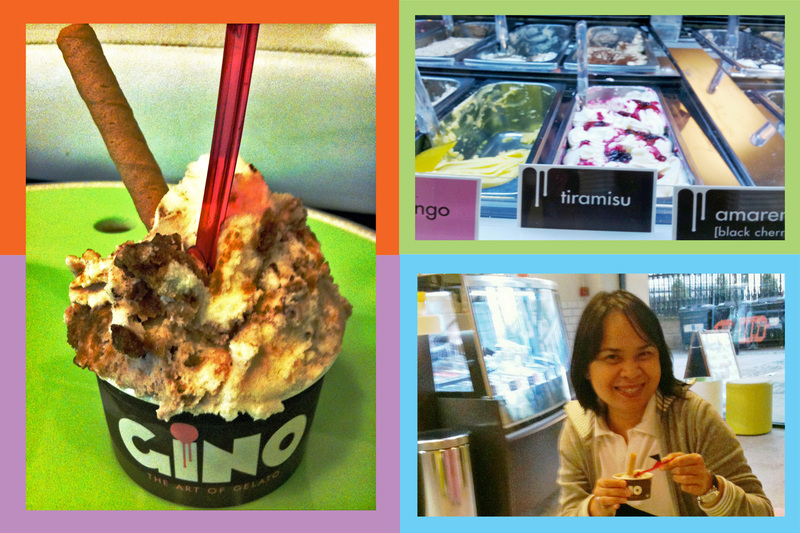 On our way to the bus station, I saw a gelato place. I enthusiastically said, ‘Look! That’s good enough. I’ll have tiramisu some other time but at least let us have a gelato.’. We went inside the store and I was almost ready to order for a coffee flavoured gelato when, lo and behold, I saw a tiramisu gelato! OMG! I asked her if we can eat inside the place as I want to take time in savouring my ‘tiramisu moment’. She looked at me, wondering, and gently asked, ‘Why tiramisu? Why today?’. I remember when I was in Assisi, I was eating tiramisu and a priest-friend said, ‘Do you know what is the meaning of tiramisu? It means ‘pick me up’ or ‘lift me up’.’ Maybe that’s why. I want to eat tiramisu because that is my prayer to God today… ‘pick me up, lift me up…’ and by eating tiramisu, I am expressing to God my utmost desire. You see, prayer is not just confined within the walls of churches or chapels. We can offer whatever it is that we do as a form of prayer… even through eating tiramisu. My friend and I looked at each other – amazed as how we were lead to that gelato place and astounded as how I was able to understand the craving, which turns out to be a yearning of a soul rather than a simple food craving. I must say though, that the tiramisu gelato is far better than the tiramisu at that Italian café. Yum yum. We were almost ready to leave, I was already standing when the background music inside the gelato place played Alanis Morisette’s ‘What if God was one of us’… and it goes like this…. ‘Yeah, yeah, God is great. Yeah, yeah, God is good. Yeah, yeah, yeah.’. He is good. He is great. And I know He enjoyed our tiramisu date. It’s really yumm and so uplifting to savour “tiramisu”, its my favourite flavour too!